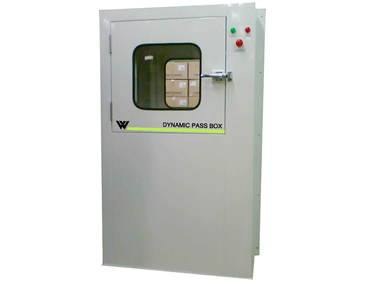 Weiber Dynamic Pass Box are self-contained units installed at the entrance to clean rooms. They minimize the amount of particulate contamination and is easy to install and adaptable to existing facilities. These boxes operate on the principle of one door opening at a time with electromagnetic interlocking so as to avoid any possibility of cross contamination. Dynamic Pass Box assists in transfer of materials driven through a controlled environment but without much personnel movement. Furthermore, this box helps in prevention of contaminants entrance either in the clean room or between various classified areas. The pass box also known as Clean Room Pass Box. Available in powder coated Mild Steel, SS 304 / SS 316/ SS 316 or a combination of both. The air forced downwards is extracted at low level into the booth's filtration system where dust particles are contained at each level of filtration prior to being re-circulated back into the booths' air stream. When the Booths is operating under normal conditions air is pulled through the main working chamber to exhaust grills, normally situated in the rear of the Booths, suppressing air-borne dust away from the operators breathing zone. Our tailor made unit has double walled construction and is available in powder coated Mild Steel, SS 304 / SS 316/ SS 316 or a combination of both. Each hinged door in our pass box has wide glass viewing window, through which material kept in the pass box can be seen. These doors are electrically interlocked type, so that any one door can be opened at a time.